Buon giorno! Welcome to Italy! 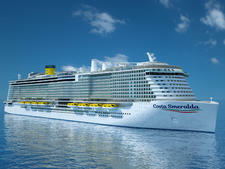 If you're a fan of the boot-shaped country, you'll likely love being aboard Costa Mediterranea. 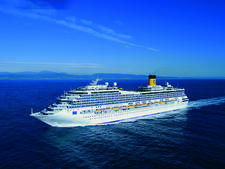 After a few years of "trying to please everybody," Costa -- operator of the only Italian-registered cruise ships -- is returning to its roots, with a renewed focus on its theme, "Italy's finest." What does that mean? You'll definitely notice it in the main dining room, where there's a pasta course at both lunch and dinner. But you'll also get an exuberant Italian greeting from Filipino cabin stewards, Indian waiters and other staff because, as the ship's hotel manager says, "Anybody can learn to talk with their hands!" 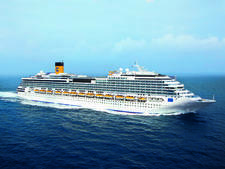 The Italian attitude extends to entertainment and the genial party atmosphere onboard. In the evenings, there are up to seven different dance venues to choose from, playing everything from Italian favorites and dance standards to Latin and Euro-pop. Entertainment staff, known as "animators," lead line dances and conduct wacky events like the "Mr. Costa Contest," which includes a partial striptease by contestants. Adopt an Italian mindset, and it's all hilariously wonderful. On the other hand, if you like to venture to exotic shores during the day, but return to a little floating chunk of America at night, Mediterranea may not be for you. The Italian-style pizza isn't piled high with toppings, there's a charge for bottled water and a good number of your fellow passengers are likely to be Europeans. Be forewarned: some of your shipmates won't speak English, and ship's announcements will be repeated in Italian, French, Spanish and German. The ship's over-the-top gaudy interiors take a bit of getting used to. Designed by parent company Carnival's Joe Farcus, they leave virtually no surface unadorned. Prepare for an abundance of bling, with Carerra marble, Murano glass, terrazzo, mosaics, inlaid wood (both real and faux), quite a few bare breasts (on artwork, not passengers), and a flock of Cupids with cherubic penises dangling overhead. Throw in an Egyptian-themed theater and a Chinese-inspired bar for good measure, and you could experience visual overload. Fortunately, Mediterranea's cabins are roomy and low-key in their decor, so your eyes get a break. The ship received a multimillion dollar refit in November 2013, but this was focused on the hull and mechanical side of the ship. However, some worn items, such as carpets, curtains and upholstery were replaced. We were pleased with the broad range of shore excursion offerings on our trip, but found the lack of any shore information or port briefings (aside from jewelry-focused information provided by onboard shopping consultants) to be disappointing. No general maps or information sheets are provided, and on our Caribbean cruise, a single orientation lecture covered only available shore excursions. 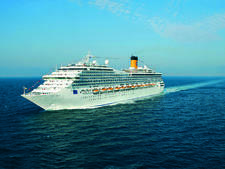 During European cruises, there are informational lectures once or twice per sailing, but no individual port briefings. So if you like to explore on your own -- you're really on your own! 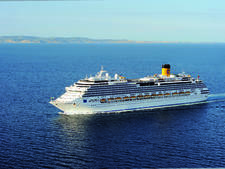 Costa Mediterranea attracts an international crowd, which varies depending on the itinerary. For European sailings, the vast majority of passengers will be European, with new passengers embarking and disembarking at every port. 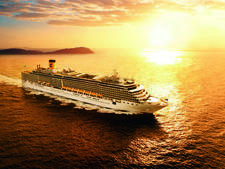 When the ship moves to the Caribbean, the mix starts to shift, with more and more passengers from North and South America as the season progresses. 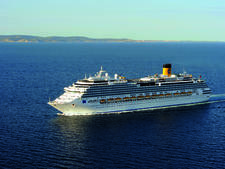 Though you might expect a lot of Italians, the ship is also popular with French passengers on its Caribbean itinerary, due to a call on French Guadeloupe. Some French passengers disembark here, while locals embark. The average age of passengers is 55, and the free Squok Club for kids means that it's a popular ship for families, particularly when school's not in session. 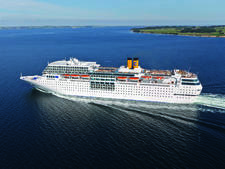 Ship staff make a real effort to accommodate various nationalities when it comes to announcements, excursions, entertainment, menus and signage. Major announcements are made in Italian, English, French, Spanish and German -- and there are designated hosts who conduct separate passenger orientations in those languages as well. Many staff are multilingual, instantly hopping from one language to another. On the downside, repetition of info in multiple languages can get tedious. We thoroughly enjoyed the polite European habit of acknowledging fellow passengers when entering or departing an elevator. Don't be surprised if a complete stranger greets you with, "Bonjour, Madame," or departs with a "Buona sera!" as the doors close. Mediterranea's evening attire is "elegant casual," which is interpreted a bit differently by different nationalities. For some women, it's slacks and a blouse; for others, it's a spangled spandex minidress. A few men sport a jacket and tie, while others don a polo shirt with the collar turned up, Euro-style. Shorts and tank tops are banned from the dining room in the evenings, though. Most sailings have two formal nights, where men are requested to wear a jacket and tie or tuxedo, while women are directed to wear a dressy pants outfit or cocktail dress. In practice, outfits were all over the map, from casual to the occasional tux. 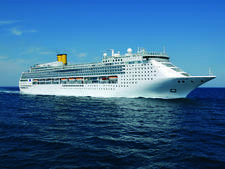 Mediterranea also has several theme nights on each cruise, including soirees like "Tropical Night," "Italian Night" (passengers are encouraged to dress in red, white and green, the Italian flag colors), and "White Night" (where white attire is requested, and an outdoor dance party follows dinner, complete with white desserts and white cocktails). Note: The infamous Costa toga parties are a thing of the past, so don't come aboard looking to get your Caesar on. 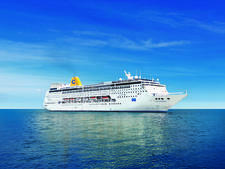 For European sailings, Mediterranea's onboard currency is the euro. 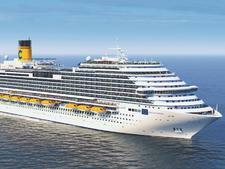 For Caribbean sailings, all onboard charges are calculated in U.S. dollars. 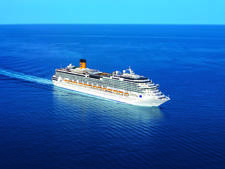 An automatic gratuity of $11 per night, per passenger (Caribbean sailings) or 8.5 euros per night, per passenger (European sailings) is added to your final bill for those 15 years of age and older; for children ages 4 to 14, it's $5.50 per night, per child (Caribbean sailings) or 4.25 euros per night, per child (European sailings); there's no charge for kids under 4. This gratuity is designed to cover all hotel staff. If you're not happy with the service, it's possible to adjust or remove the charges. 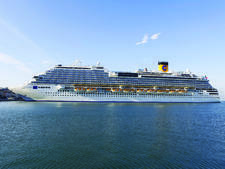 In practice, we noticed European passengers giving additional tips to their waiters at the end of the cruise (as well as kisses on each cheek), and a number of passengers told us they planned to tip their cabin stewards in cash as well. A 15 percent gratuity is added to all beverages ordered at onboard bars (including alcohol, water, soft drinks and coffee) and beverages ordered in the dining rooms. If you buy one of the beverage packages, the gratuity is included in the package price. A 15 percent service charge is already included in the price of any spa treatments, beauty salon services and fitness classes or personal trainer sessions. 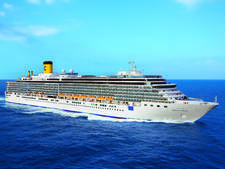 Glitz, glass and colorful neon lights reminiscent of Miami's South Beach -- there's never a dull wall or unadorned ceiling aboard the 3,724-passenger Costa Diadema.